I needed desperately to squeeze those chunky legs, to hear that melodic laugh and to hold that tiny hand in mine. It was time. Nana had to see Ayda. I made the arrangements with my eldest and drove through rain most of the day to arrive at the pre-determined meeting place. After a late lunch, we transferred her belongings to my car and headed north. She is only four so I was a tiny bit nervous that she would get upset when we pulled out of the parking lot, but she just said, “I’ll miss mommy and daddy” and that was that. We chatted about pre-school and recent birthday parties and Christmas. “Ayda, do you see the leaves? Do you know about the fall season?” I asked. She answered in what I thought was somewhat condescending tone and said, “Nana, are you talking about autumn, when the leaves turn beautiful colors like yellow and orange and brown and fall from the trees?” Yes, my dear. Yes, I was. In a couple of hours, we were pulling into a hotel driveway, ready to stop for the night as our destination was Pigeon Forge, TN. We were going to visit relatives and she was excited to get to spend time with some of her younger cousins. She wasn’t sure about this whole idea of staying in a “cabin” though. For some reason she thought all cabins were inferior dwellings. As we passed barns and falling down sheds, she would ask, “Nana, is it a cabin like that?” I assured her that it certainly was not and that she would be pleasantly surprised. Nana forgot how time consuming it was to unfasten a car set, put shoes back on and wait for little slowpoke to crawl out of the back of my Mustang. After we checked in, I realized that with my bag, her bag, her toy bag, her snack bag, her electronic game and dinner we had picked up, I was going to need a cart. I grabbed one, loaded it and sat her on top of my bag before realizing I had to do something with my car. After arranging the cart inside and loading her back into the car seat, I found a parking place and we were ready to go upstairs. Pushing the cart was akin to maneuvering a side-ways driving Walmart shopping cart filled with groceries. I finally managed to get it to the elevator without taking some drywall with me. Ayda spotted the “fire sign” and wanted me to tell her what it said. I read, “In case of fire do not use the elevator”. Way to go, Nana. Little did I know that every time we used an elevator for the rest of our journey she would ask quite anxiously if I was sure there wasn’t a fire and explain that maybe we shouldn’t ride the elevator. Thankfully, a nice young man helped me get the cart onto the elevator and even got off at our floor and pulled it out for us. I think he discerned that Nana was exhausted and I was sincerely grateful for his kindness. Finally, it was bedtime and Ayda and I lay in the darkness, the only light emanating from her Nabi which is NOT a computer, Nana. It’s an electronic game that also has episodes of some of her favorite shows. I wasn’t going to argue with her about watching one on our first night together, far from home. 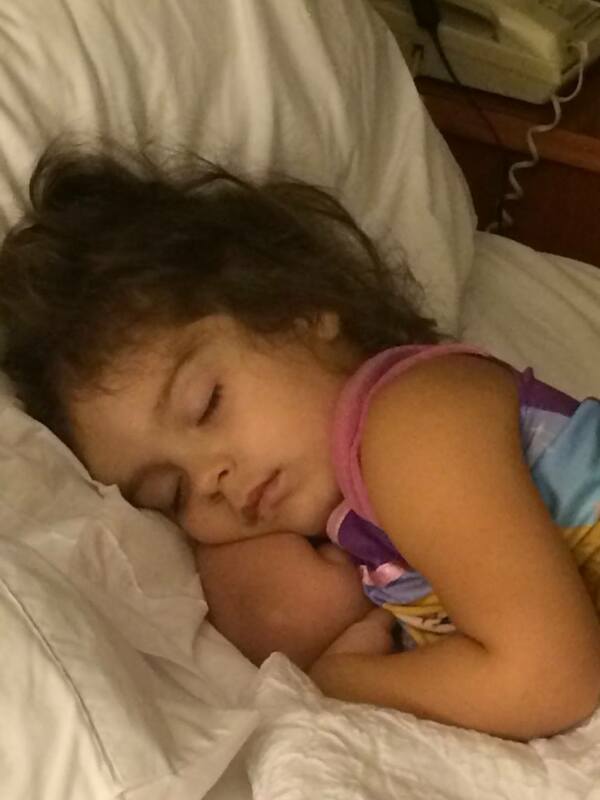 We talked about our plans and said prayers and she was out like a light. I decided the next morning to let her sleep in; partly because she needed it and partly because I love to watch her sleep, with her little brown tendrils floating across the pillow. Before long her eyes opened wide and the first words out of her mouth were, “Why is that light on?” You waked me in the dark and you are supposed to wake me in the light?” I quickly rose from the chair I was perched on and opened the light blocking curtains. She grinned when she saw that it really was daytime and then she snuggled in my lap while her little body finished waking up. I dressed her and brushed her long curls carefully and reacquainted myself with pig tails and bows. We went down to the continental breakfast in the hotel lobby where Ayda picked a muffin. I looked up to see her with a horrible expression, somewhere between tears and disgust and discovered that said muffin had hidden berries. I assured her she could spit them out and I got up to make a waffle for her instead. The waffle was acceptable and I sat there and enjoyed my coffee, the grinning recipient of the “She is so precious” and like compliments, like grandma’s do. We arrived at the cabin later in the day and she was thoroughly impressed, as was I. There were stuffed bears and toys and snacks and a bunk-bed and the promise of soon-to-arrive children. We enjoyed the time with family and I enjoyed time with her out and about in Pigeon Forge and through the Great Smokey Mountains. She loved being with family and was not happy on Saturday, when it was time to go. We travelled home towards South FL, because Papa had been unable to join us due to work and he was dying to see her, as were others in the family. We took a little longer route to go through the Smokies and stopped several times to pick up leaves and get pictures. We stopped for ice cream in Cherokee and picked up taffy, pecan logs and a coloring book near the GA/FL line. 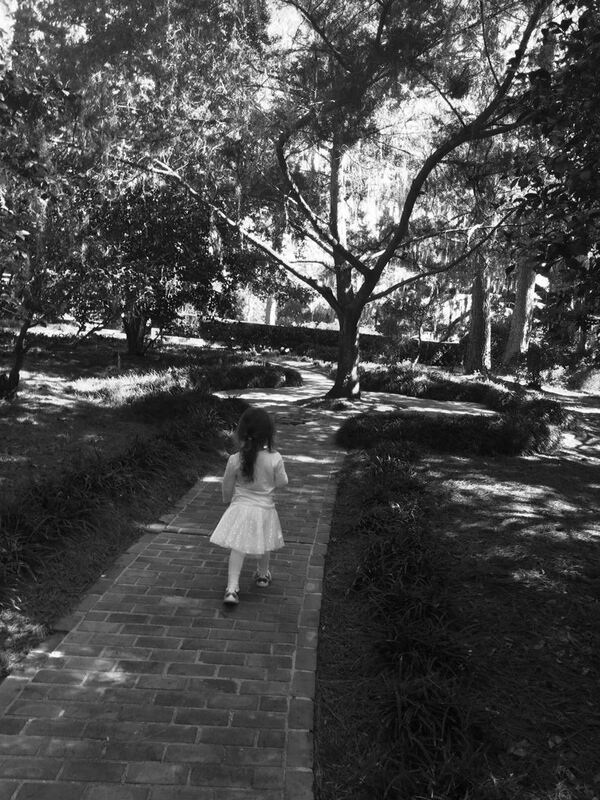 I have never seen a 4 year old travel so well. She never complained; she sang, made me tell her stories about Jesus and played. Every once in a while she would ask, “How much longer til Papa?” Every once in a while, I would reach back to squeeze her leg and she would grab my hand and hold it for a few minutes. Oh, the feeling of that little hand securely snug in my own! After a week with Nana and Papa, assisted by Aunt Dee, since Nana had to work, we made the journey back to meet her mommy. We stayed in another hotel and the next morning we found a pumpkin patch with a maze and then met mommy at a beautiful state park. 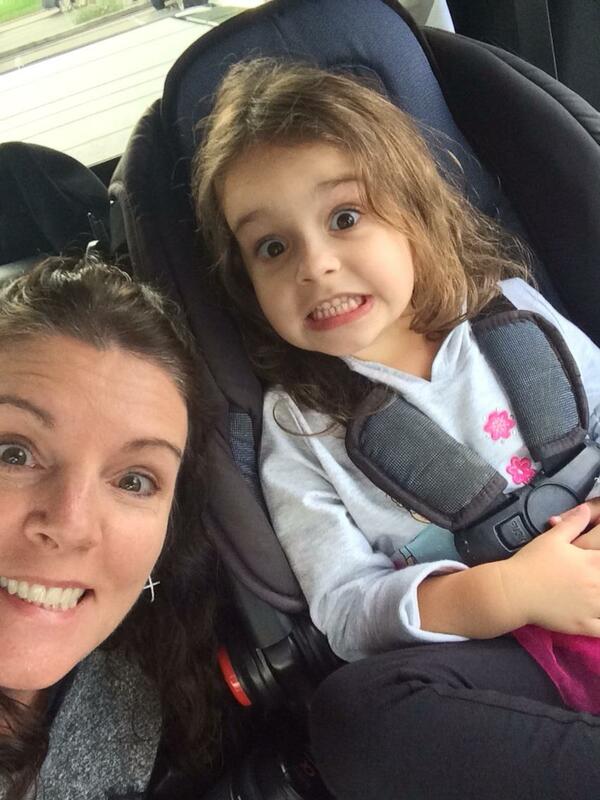 As my daughter strapped her in the car seat, she said, “I’ll miss you Nana”. I told her not to cry and that it wasn’t goodbye just see you later. I got in my quiet car, tears welling up in my eyes and my heart aching with missing her already. With a song of praise and a prayer I encouraged myself and headed south alone, thankful for the precious time with her. 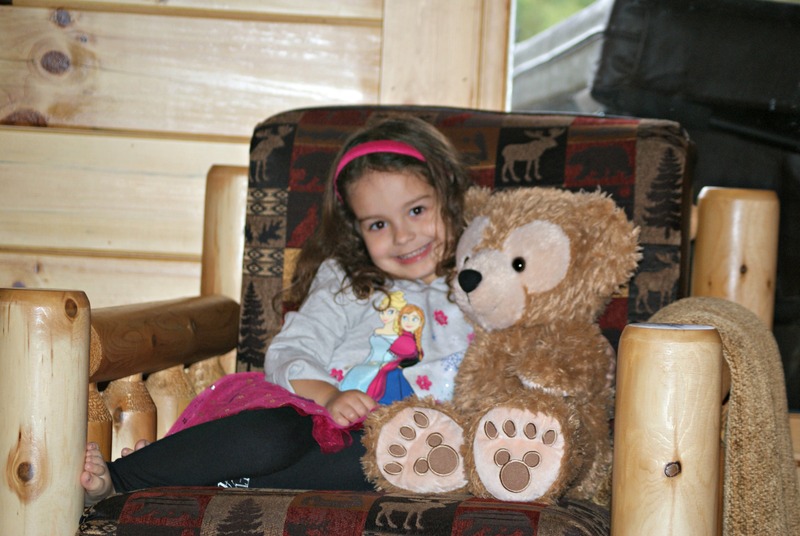 I loved reading about your trip with little Ayda. She sounds an absolute dream! I remember my great-niece at that age and how spending time with her would make my heart smile. It still does. Very, very cute. 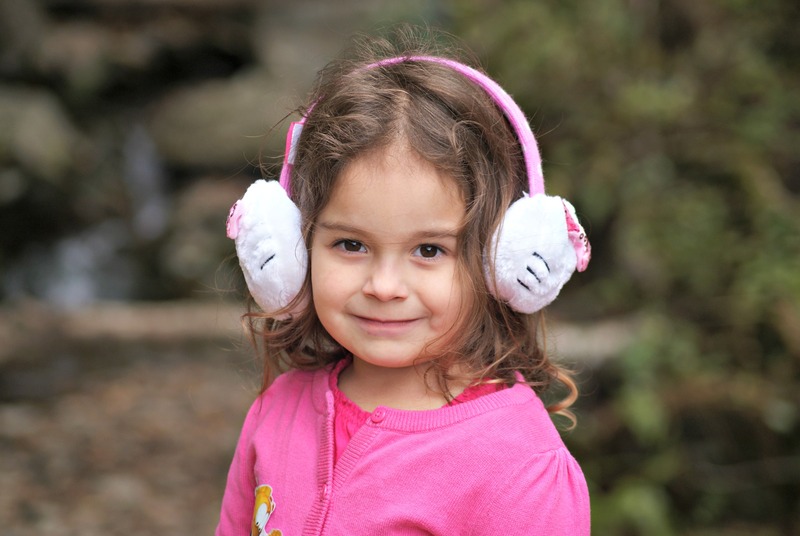 The ear muffs remind me of the ear muffs I bought online for my daughter today. She is 14 and not into girly pink stuff anymore so I got her her favorite animal print kind. Thanks to online shopping. . . I do miss the times I bought her cute girly stuff and she liked wearing them. Love it and can’t wait to be a Nana myself one day!! This little one is a beauty inside and out, as it radiate from within her. Would expect nothing less as true beauty runs deep in your family.